Every day, more than 115 people in the United States die after overdosing on opioids. The misuse of and addiction to opioids—including prescription pain relievers, heroin, and synthetic opioids such as fentanyl—is a serious national crisis that affects public health as well as social and economic welfare. The Centers for Disease Control and Prevention estimates that the total "economic burden" of prescription opioid misuse alone in the United States is $78.5 billion a year, including the costs of healthcare, lost productivity, addiction treatment, and criminal justice involvement. 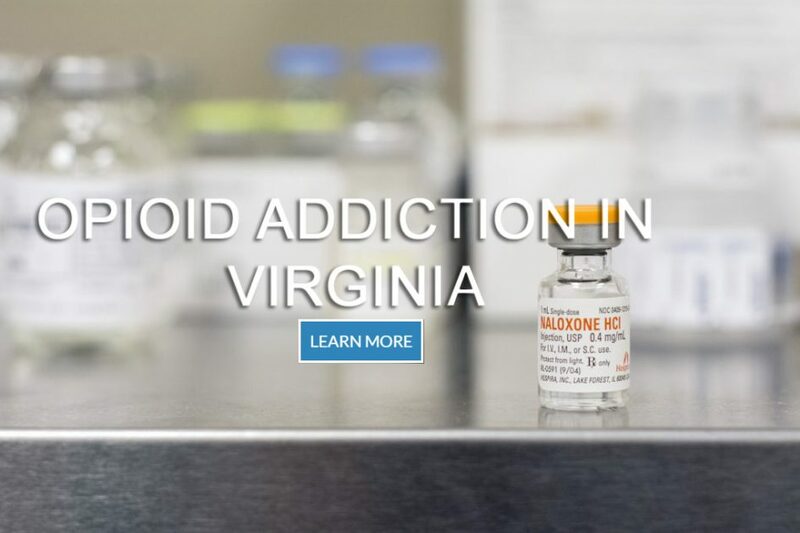 Visit the website for the Regional Opioid Taskforce: opioidsolutionsrva.com. 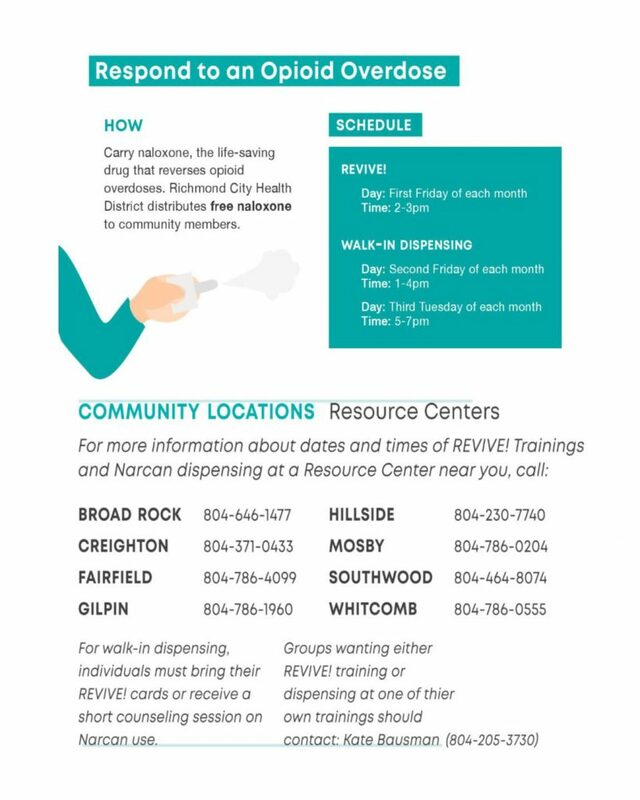 Persons who complete the REVIVE training are given knowledge and resources needed to save a family member or friend who has overdosed on opioids. REVIVE! is helping people learn how to recognize and respond to opioid overdose emergencies by administering naloxone. 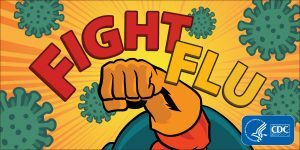 Richmond City Health District is offering FREE flu shots while supplies last. We are accepting walk-ins for infants > 6 months, children, and adults at our Cary street clinic (401 E. Main Street) between 8:00 a.m. - 4:30 p.m. Monday -Thursday and Friday 8:00 a.m.- 11:30 a.m. Minors will need to have a guardian/parent to provide consent. Our Resource Centers will take walk-ins for adults only (sorry kids) during clinic hours at the following Resource Centers: Monday: Creighton; Tuesday: Gilpin; Wednesday: Mosby and Thursday: Southwood. 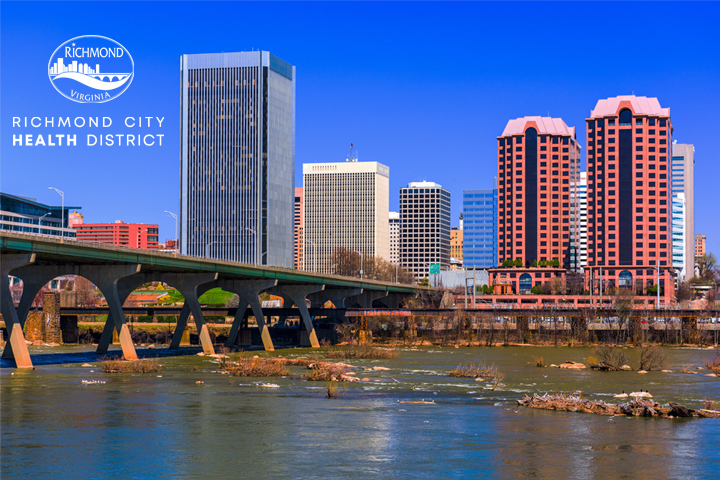 Visit http://www.vdh.virginia.gov/richmond-city/resource-centers/ for hours and location. Active & Healthy is the theme for National Minority Health Month 2019, and the Office of Minority Health will join their partners throughout the country as they promote physical activity to help people live healthier lives. An active and healthy lifestyle can help reduce the risk of high blood pressure, type 2 diabetes and other chronic diseases. According to the 2nd edition of the Physical Activity Guidelines for Americans released last year, adults need at least 150-300 minutes of moderate-to-vigorous physical activity each week with muscle-strengthening activities two or more days a week. Learn more at https://minorityhealth.hhs.gov/NMHM19/. Given this data, STD Awareness Month is a timely reminder to continue to raise awareness about STDs, take action to mitigate the increase in STDs in the U.S., and reduce STD-related stigma, fear, and discrimination. Learn more at https://www.cdc.gov/std/default.htm. Click here for information on Health Fairs, Outreach and Speaker Request Form, STI Evening Screening Clinic, Food Safety Training, WIC, Tobacco Free Schools, My Meal Detective and Refugee Program. Pingback: Nurture Receives a $60K Breastfeeding Grant - nurture.